So, first of all, this is the blog I’ll be using for my year abroad in Indonesia. I’ll try and write interesting things, introduce you to some of the wonderful people I’ll (hopefully) be meeting, and post as many pictures of orangutans as I can. I want to use this to keep everyone updated on what I’m doing and how things are going. So, to that end, here’s what I can tell you so far. I found out my placement, via e-mail, a few weeks ago. It’s in a city called Pontianak in West Kalimantan, Indonesia, on the island of Borneo. If you look at the map just below, you can find Pontianak on the Equator on the country’s west coast. Yes, I’ll be right on the Equator. Yes, it is hot on the Equator. But as far as I can tell, I hopefully won’t be running into too many of these while I’m there. Actually receiving my placement was the most excited I’d been since I found out that I had been selected as a Fulbrighter, and it brought the upcoming year back squarely into my point of view. And then I got to go to DC. From June 24 – 28 I had a Pre-Departure Orientation (PDO) in DC with the whole Indonesia crew (pictured below) as well as many other Fulbrighters going to other countries in the East Asia Pacific (EAP) region. 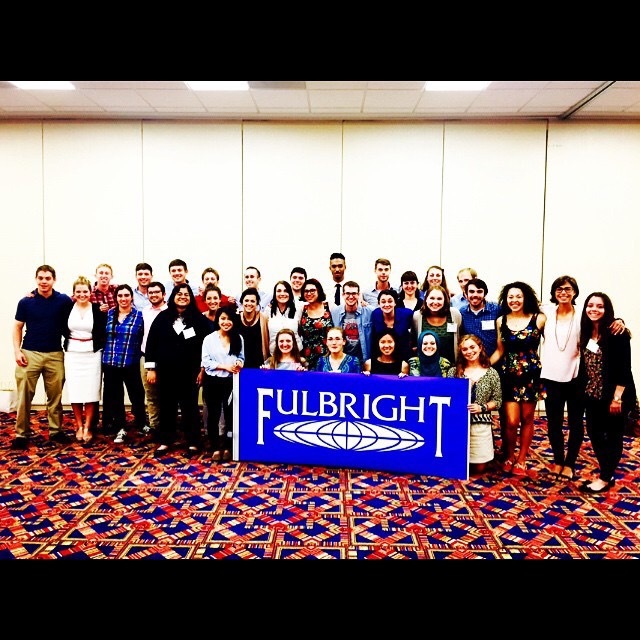 We heard from representatives of the Department of State and the Fulbright Program that reinforced the value of what we would be doing while abroad and the uniqueness of this opportunity. It is likely that I am the only American that many of the people I will meet have ever interacted with, and this will obviously provide some rich cultural exchange. I expect to have a few cultural faux paus while I’m navigating living in Indonesia for those nine months, and I also anticipate fielding hundreds of questions on what Americans think and why we think that. It’s a tall task to be the voice of the entire United States as some Indonesians may expect me to be, but I’m excited to see on a very real level the differences between Western and Eastern cultures. We also met the staff of the American Indonesian Exchange Foundation (AMINEF) who will serve as our primary contact point in the country. We heard from alumni that had been to Indonesia before as ETAs and were able to give us all kinds of advice (e.g. “teach your students to play dodgeball cause it may be hilarious,” or “actually buy the Crocs-looking shoes cause they’ll save you during the rainy season,” or “get used to sweating through your shirt every single day”). I’ve had many questions all throughout this process and didn’t really know who to ask or how to figure them out, so these alums (all of whom will be returning to Indonesia for a second year) proved invaluable. Orientation was helpful and prepared me in a lot of ways, but it chiefly reinforced my excitement for the upcoming year. I’m ecstatic to live in a Muslim majority country for the first time and have the opportunity to be both an ethnic and religious minority. I’m ecstatic to see the beauty–geographical and cultural–of the world’s fourth-largest country and learn to acclimate to an entirely foreign lifestyle. I’m ecstatic to “get outside my comfort zone” and “push my limits” and all the kinds of cliche terms that people use that nevertheless ring true. I’m nervous and eager and worried and everything in between. And hopefully I can do a good job of keeping all you in the loop. Whooooooooo! Gonna love reading this.